Have you ever wondered how solar panels work? If so, this article should be your first step in gaining a better understanding of how a solar cell converts sunlight into electricity. This process is known as photovoltaics, so let’s begin by taking a look at that. Your first step in understanding how solar panels work is to understand the photovoltaic process. We define solar photovoltaics (solar PV) as the conversion of sunlight into usable electricity. A young French physicist known as Alexandre-Edmond Becquerel first observed this process in 1839. In his discovery, he saw that when silver-chloride coated platinum electrodes were exposed to sunlight, they generated voltage and current. Becquerel’s discovery was the basis for future advancements in solar PV technology. Throughout the rest of the 1800s and early 1900s, many other discoveries were made by physicists all over the world. In 1932, the photovoltaic effect was discovered in the inorganic compound Cadmium selenide (CdSe). It is this compound which is still used in many of today’s photovoltaic cells. In the mid-1900s, the first practical silicon solar cell was made. 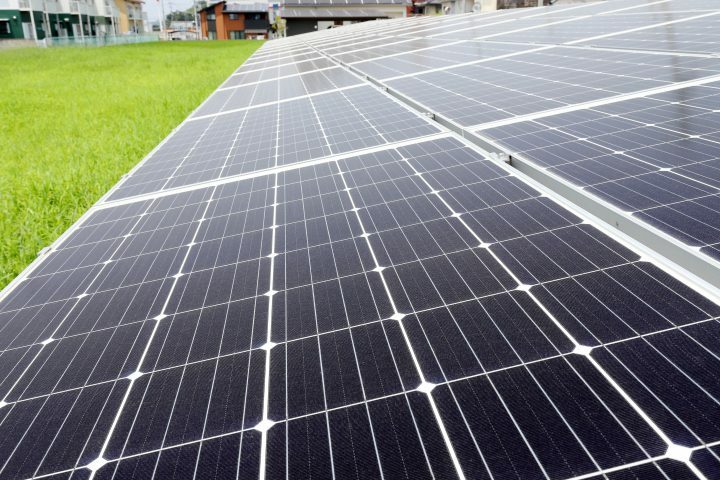 Since then, the technology behind silicon solar cells has improved considerably, making them the most popular material for photovoltaic modules today. Now that you have an understanding of solar photovoltaics, we can take a look at how solar cells use this to generate electricity. A solar panel can contain a number of solar cells to help increase capacity. It is these solar cells that do much of the work. Most modern solar cells are made from wafer-thin silicon crystals known as crystalline silicon. These are etched onto a solar panel and then coated with silicon nitride to help reduce glare. Doing this allows a solar cell to absorb more light, instead of reflecting it. For a full breakdown on how silicon solar panels are made, take a look at our article on this topic here. Here, you can see the different solar cells that make up a solar panel. Once you have installed your solar panel, the cells it contains are able to absorb sunlight and use the photovoltaic effect to create electricity. This might be in the form of either DC or AC electricity depending on the type of panel you install. By default, solar panels produce DC current and you will require an external converter should you wish to attach your system to an external AC power circuit (such as your country’s power grid). There are, however, a growing number of solar panels that come complete with integrated micro-inverters. These panels are capable of directly producing AC rather than DC electricity. It may be no surprise that solar panels generate more electricity on a sunny day than a cloudy one. It is for this reason that solar cells are more common in sunny countries as they can benefit more by using the sun as a renewable energy source. Direct Usage – For powering appliances on a local electricity circuit. Charging Batteries – Solar PV cells can directly charge battery packs for use at a later time. Net Metering – A scheme in the United States that allows you to feed excess home solar energy (and wind energy) back to the electric grid. You then receive credits based on the flow of electricity and can use them at a later time to draw electricity back from the grid. This may be during the night when your solar panels are unable to generate electricity. Are you interested in the installation of solar panels on your property? If so, we have an article on the benefits of using solar energy at home which might be of interest to you.